The tablet is a device that is proving to revolutionize the way students deal with technology in the classroom. The detail and depth of information that tablets offer far surpasses that of a conventional textbook, in part because tablets offer a far more interactive experience. A science textbook might offer charts and graphs to put dense text into perspective for the reader, but a tablet can allow a student to manipulate and investigate data on the same charts and graphs. 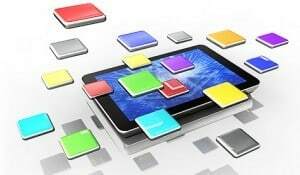 With web connectivity, tablets offer an inexhaustible list of teaching materials, which this already tech-savvy generation should be able to grasp more comfortably on a screen. The educational benefits of tablet usage apply to every type of student: those in online college courses can use them for distance learning classes, and primary school students can use the same tablet to learn their ABC’s. Its appeal and usage is universal for any student who wants to interact with teaching materials. But in case you’re not totally convinced about the tablet’s place in the realm of education, I’d like to show you some of the finest examples of educational tablet apps available. Outliner for iPad is a great organizational app for both students and teachers who want all their ducks in a row. Students can use the app to outline important chapters in a textbook or to simply take notes as they listen to a lecture or watch an instructive video. The bare bones interface should be welcoming to even the least tech savvy students using the app. Alternately, teachers can use the app to organize class schedules and lesson plans using the more advanced customizable interface options. This app would be a godsend for students studying foreign languages and struggling to comprehend the new vocabulary. Word Lens works quite simply: you just focus the lens of your tablet on some text, and the app translates that text into the desired language. With the app, a student frustrated by a complicated phrase in French can see it rendered clearly in English, or vice versa. The free app comes with French and Spanish translations built in, but you have to pay more money if you want to translate different languages. This is an app for outside the box thinkers. Penultimate is designed to be a sort of notepad app that allows you to write text and draw images on your tablet as if you were doing so on a pad of paper with a felt pen. It has a more organic and freeform feel than the abovementioned Outliner, allowing the user to write out text in whatever manner suits them best. If you like taking notes on the fly, then this is the app for you. Changing gears a bit, there’s the wonderful app Project Noah for nature lovers and students fascinated by the science of life. Project Noah is a comprehensive app designed to help the user locate and identify local plants and animals, providing detailed information on thousands of species. Students of all ages will have a blast as they go out into nature armed with their tablet to aid their search for a certain bird, flower, or mammal. What’s more, Project Noah allows you to share your finds with fellow users in your area or abroad. What an educational social media experience!